To make the cupcakes, preheat oven to 160°C (325°F). Place the flour, cocoa, sugar, butter, eggs, milk and vanilla in the bowl of an electric mixer and beat on medium speed for 6 minutes or until pale and smooth. Spoon the mixture into 12 x ½-cup-capacity (125ml) cupcake tins lined with paper cases. Bake for 22–25 minutes or until cooked when tested with a skewer. Transfer to a wire rack to cool completely. To make the vanilla butter icing, place 250g softened unsalted butter in the bowl of an electric mixer and beat for 6–8 minutes or until pale and creamy. Scrape down the side of the bowl, add 2 cups (320g) sifted pure icing (confectioner’s) sugar and 1 teaspoon vanilla extract and beat for a further 10–15 minutes or until light and fluffy. To decorate, spread with the icing. 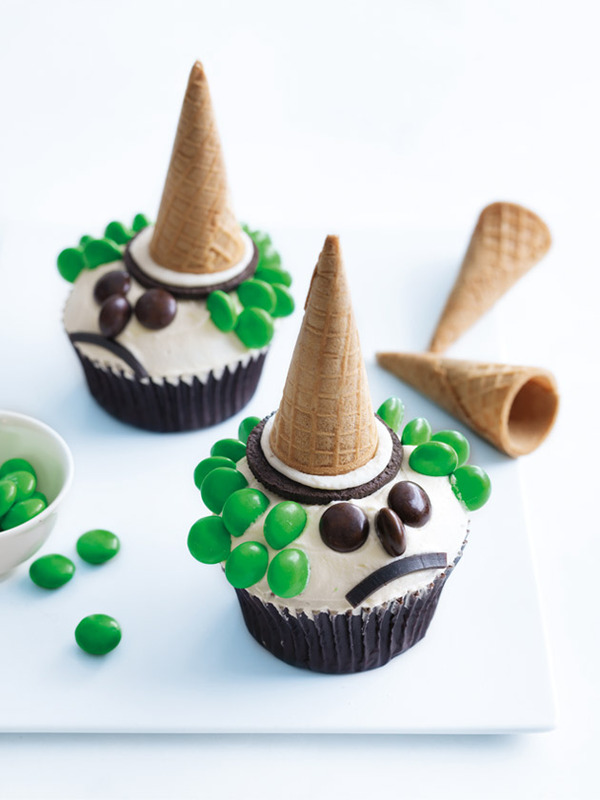 Press a cone onto each biscuit-half with icing to make the hats and press a hat onto each cupcake. Decorate with the candy-coated chocolates for the hair, eyes and noses, and the licorice for the mouths. Makes 12. Tip: Before assembling the witch’s hats, twist the biscuits apart, ensuring all the icing stays on one half.